i've been craving comfort food. the kind of comfort food that makes you feel warm and fuzzy. fall of the bone beef short ribs with creamy mashed potatoes...yum. i do love mashed potatoes, but don't tell my husband. so, i got to thinking, what could i substitute the potatoes for? and it hit me...cauliflower. heck, i make pizza crust with it! with it's versatility and ability to take on flavors, it's practically white gold. compared to some recipes, i've cut some corners and used fewer ingredients, but you'd never know. i promise! i also prefer a more rustic approach, so i don't bother with straining the sauce. it might be better to try this out on a weekend, because it needs a good 3 hours to get it fork tender (or 2 hours if you're impatient). i make it on weeknights, but we don't usually eat dinner until about 8:30pm. my recipe calls for red wine, but i've made it dozens of times without. if you decide to go 'shirley', just double the beef broth. and, if you're out of beef broth, you could use water and throw in some bouillon paste/powder/cubes. start by sprinkling short ribs with salt. heat a dutch oven or large pot over high-heat. add 2 tbsp of olive oil. add the short ribs to the dutch oven and brown both sides. don't be afraid to let it caramelize and get little crispy bits. that'll add lots of flavor. remove short ribs from dutch oven and set aside. quickly toss in the onions and celery. stir until translucent. add the garlic and stir for about 30 seconds. return the beef short ribs to the pot, and throw in the beef stock, wine, balsamic vinegar, tomato paste, thyme, and bay leaf. stir and bring to a boil. then, reduce the heat to low. put on a lid and allow to simmer for 3 hours. 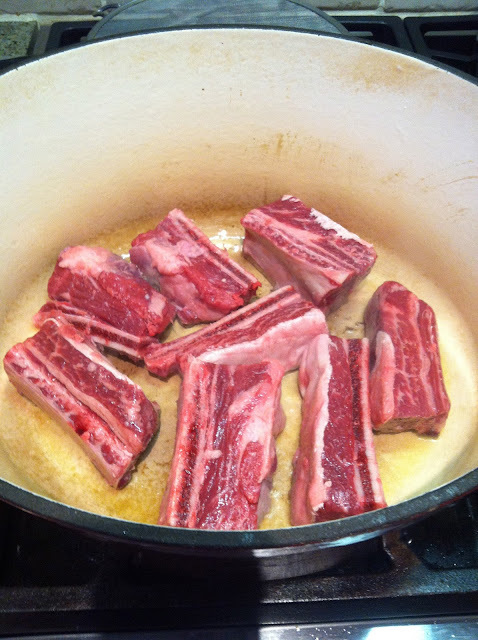 check on it about every 45 minutes by stirring and flipping the short ribs. for the last 45 minutes, allow it to simmer uncovered. remove the thyme stems before serving. 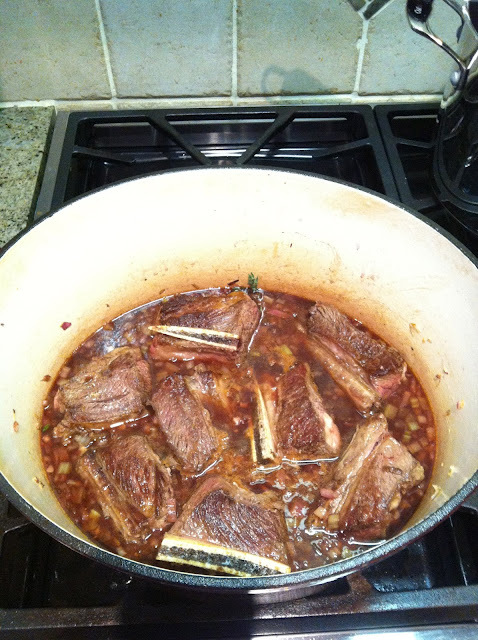 while the short ribs are braising on the stove, preheat the oven to 425 degrees Fahrenheit. 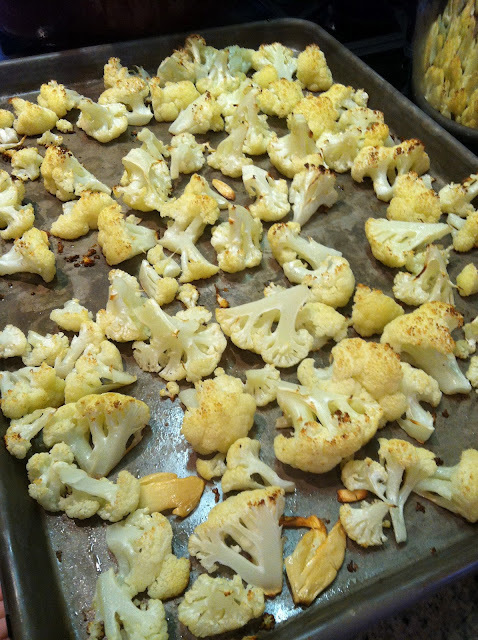 place the cauliflower florets and garlic onto a large baking sheet. drizzle olive oil (about a tbsp) over the cauliflower. sprinkle with salt (about a tsp). mix with your hands and place baking sheet into the oven. bake for about 15-20 minutes. remove from oven. put the cauliflower and garlic and cheddar cheese into a food processor (you can use a hand blender), and puree until smooth. add cream (about a 1/3 cup) to give it a creamy consistency. remember, you're going for a mashed potato feel. add salt and pepper to taste. 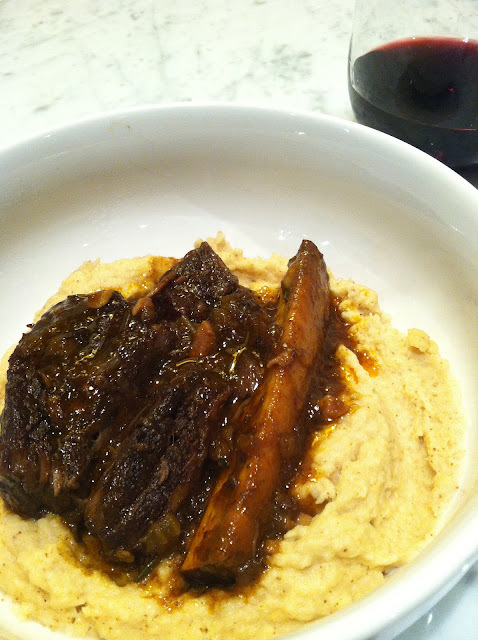 once the short ribs are tender (they may have already fallen off the bone), serve hot over mashed cauliflower. spoon sauce over the short ribs.